Mélanie Rocan has garnered significant national attention for her painting practice, which brings a personal perspective to difficult issues while exploring relationships between the physical and the spiritual. 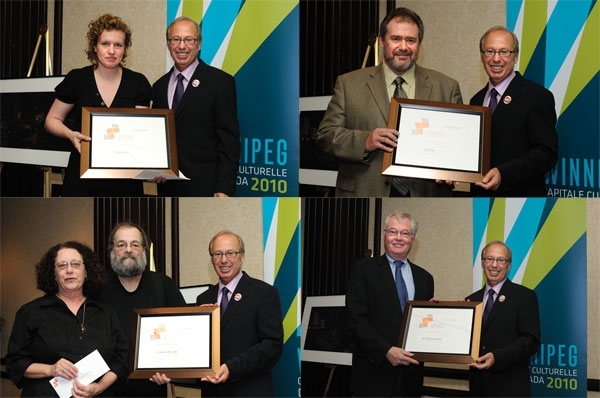 Nominated by Winnipeg Art Gallery. Yuri Klaz is the conductor of the Winnipeg Philharmonic Choir, Winnipeg Singers, Shaarey Zedek Synagogue and First Mennonite Church Choir. He has made a major contribution to these organizations, the Winnipeg choral community and Canadian choral music. Nominated by First Mennonite Church Choir, Shaarey Zedek Synagogue, Winnipeg Philharmonic Choir and Winnipeg Singers. This extraordinary couple’s contribution to the arts in Winnipeg started in 1974 with the creation of the Winnipeg Centennial Folk Festival—and that was only the beginning! Nominated by Vivian Gosselin, Ali Hancharyk, Josey Krahn and Tim Osmond. The Winnipeg Foundation has been a true champion in our community, providing more than $200 million for hundreds of projects, helping organizations build sustainable endowment funds, and inspiring philanthropy and volunteerism in our community. Nominated by Winnipeg Folk Festival.